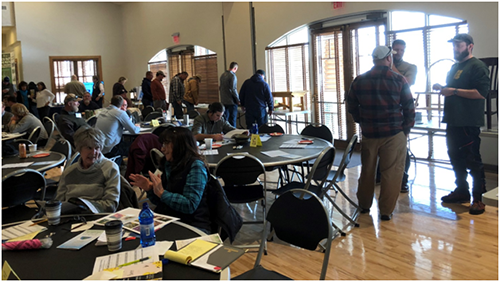 On January 25, 2019 the Cheyenne Urban Forestry Division hosted the 5th Annual Green Industry Workshop at the Kiwanis Community House. Over 100 professionals from the green industry attended to hear from 6 different speakers. 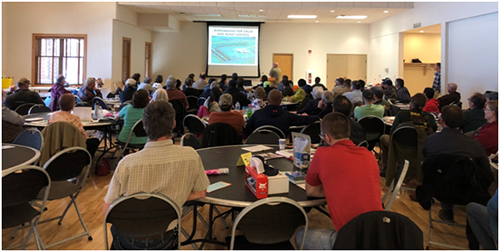 Educational sessions provided professional information, as well as International Society of Arboriculture and Wyoming Commercial Pesticide CEU's. The day began with breakfast, networking, and a warm welcome from Cheyenne Community Recreation and Events Deputy Director, Jason Sanchez. 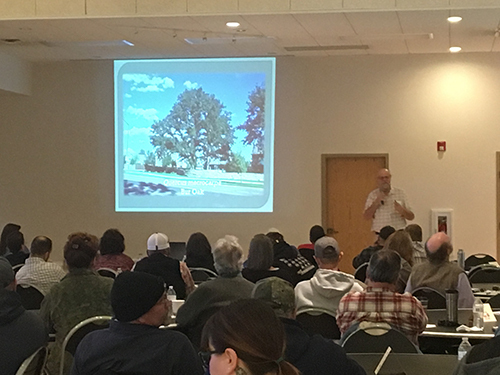 On January 26, 2018 the Cheyenne Urban Forestry Division hosted the 4th Annual Green Industry Workshop at the Kiwanis Community House. Over 100 professionals from the green industry attended to hear from 9 different speakers. 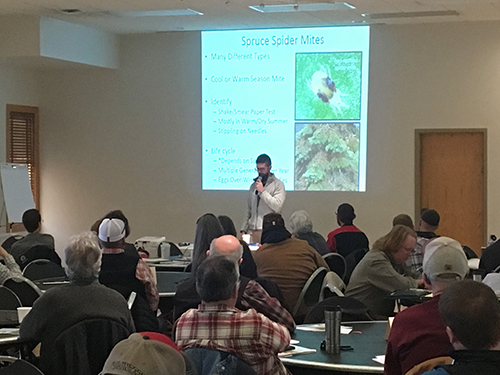 Educational sessions provided professional information, as well as International Society of Arboriculture and Wyoming Commercial Pesticide CEU's. The day began with breakfast, networking, and a warm welcome from Cheyenne Community Recreation and Events Director, Teresa Moore. There was a great lineup of speakers and topics, and most presentations along with archived presentations from past workshops can be downloaded here. We also had many door prize donations from: Bobcat of the Rockies, Boot Barn, CPS Distributors, DBC Irrigation, Dickey’s Barbeque, NORCO, Wyoming Work Warehouse, andÂ Wyoming State Forestry. 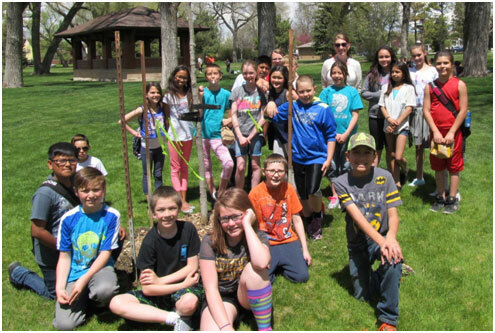 A new portion of the workshop in 2018 included a silent auction with all proceeds going to plant street trees throughout Cheyenne through the Rooted in Cheyenne program. The silent auction raised over $1,300.00 to purchase trees, thanks to the following generous donors: Big Paws Lawn and Tree Care, Blue Credit Union, Cheyenne Civic Center, Cheyenne Frontier Days Old West Museum, Chick-Fil-A, CPS Distributors, Daniemark’s, Dave Schindler, David Ohde, DBC Irrigation, Eric Hammer, Flydragon Design Art Studio, Gardening With Altitude, Gnarled Root, Holmes A-One, Inc, John Mahoney, Laramie County Conservation District, Martha Millikin, Murdoch’s, Northview Chiropractic, Paramount Ballroom, Paramount Café, Plant Select, Rx Tea Time, Steve Scott, SAF-Alpha Student Chapter, Vinney Miller, Visit Cheyenne, and Wyoming State Forestry. 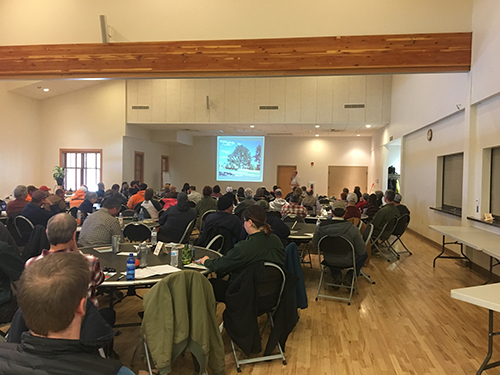 We look forward to our 5th annual workshop in January 2019!If you would like to assist in the planning or if your business would like to be a sponsor for next year’s event, please contact Cheyenne Urban Forestry or call (307)637-6428. 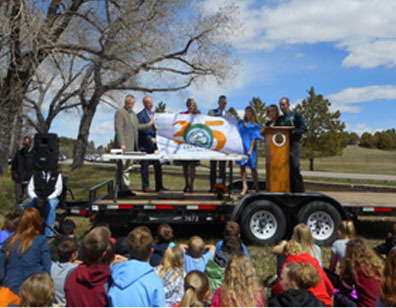 On April 24th, the Cheyenne Urban Forestry Division hosted the City of Cheyenne's 35th & the State of Wyoming's 129th Arbor Day Celebrations at the High Plains Arboretum. 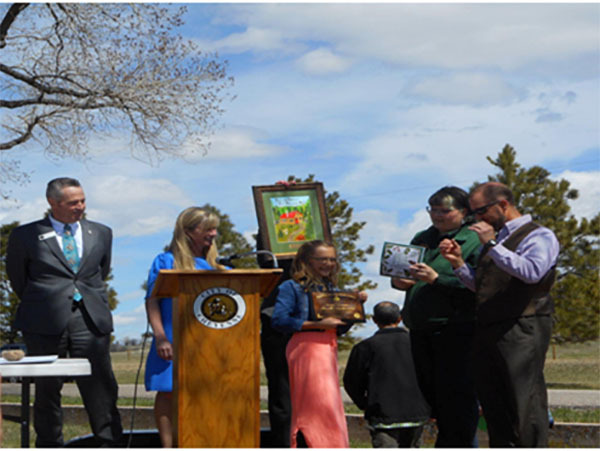 Governor Matt Mead and Mayor Marian Orr gave an Arbor Day proclamation and Cheyenne received the Tree City USA award and Growth Award from Mark Hughes of the Wyoming State Forestry Division. During the event, Forestry staff took a moment to celebrate the retirement of Lisa Snyder, Director of Cheyenne Urban Forestry. Lisa has worked for Cheyenne's forestry division for 32 years and has helped to build and shape the division into what it is today. She will be missed! off the ground and running. 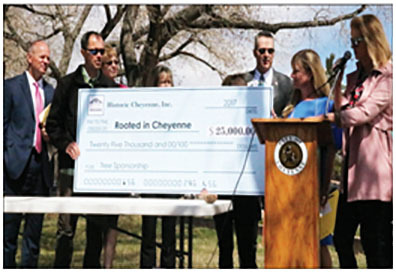 If you would like more information about Rooted in Cheyenne, click here. 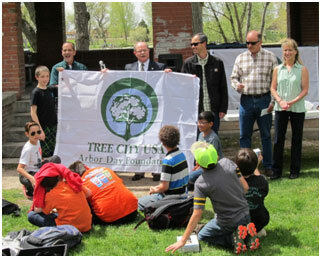 This year's 3rd Annual Treetober Fest took place on October 10 at the City's High Plains Arboretum west of town. 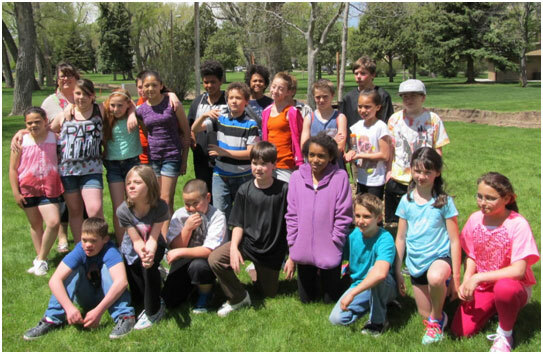 Over 70 kids from the City's Latchkey Program participated in the outdoor educational event that included six stations where kids learned about the plants, wildlife and history of the High Plains Arboretum. 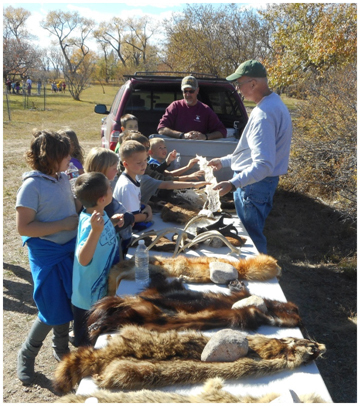 The event was sponsored by the Cheyenne Urban Forestry Division with support from the Cheyenne Botanic Gardens, the Laramie County Conservation District, the Wyoming Game and Fish Department and Scrumpy's Cider. 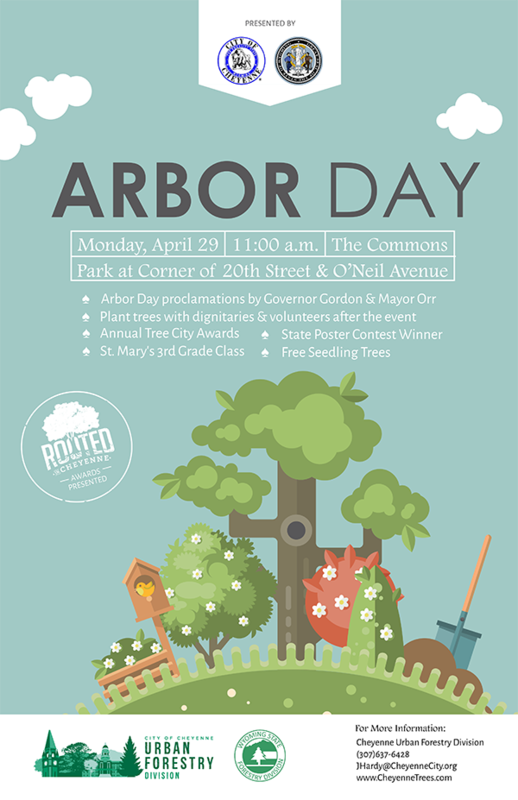 This year's Treetober Fest was an opportunity to promote the High Plains Arboretum and encourage kids and their families to visit the arboretum. The High Plains Arboretum is located at the Cheyenne Field Station which is west of Cheyenne off of Round Top Rd. at 8301 Hildreth Road. The Field Station began planting a large variety of trees, shrubs, fruits and vegetables in the 1930s to determine which species were hardy to the high plains. The arboretum sits on City property and is open to the public. 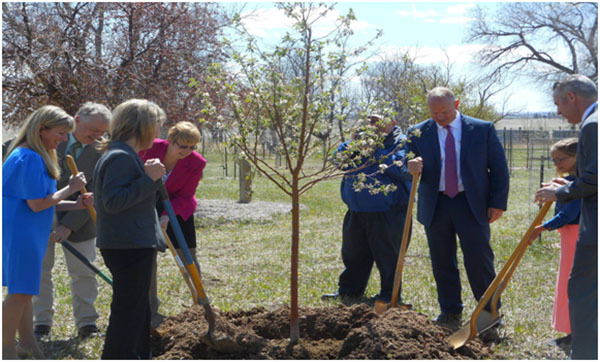 The arboretum features over 60 different trees and shrubs from around the world and includes markers which identify many plants and gives brief descriptions, including country of origin and year planted. To view a recently completed video of the arboretum, click here. 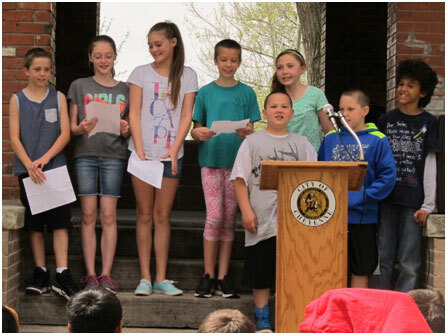 A group of fifth graders recite a poem they wrote called "10 Reasons that Trees are Awesome"